Healthy lawns don't need weed control! That's why organic lawn care from Pleasant Green Grass is the best option for the health of your lawn. We offer lawn care services in Apex, Cary, Carrboro, Chapel Hill, Durham, Hillsborough, Morrisville and the West Raleigh area. 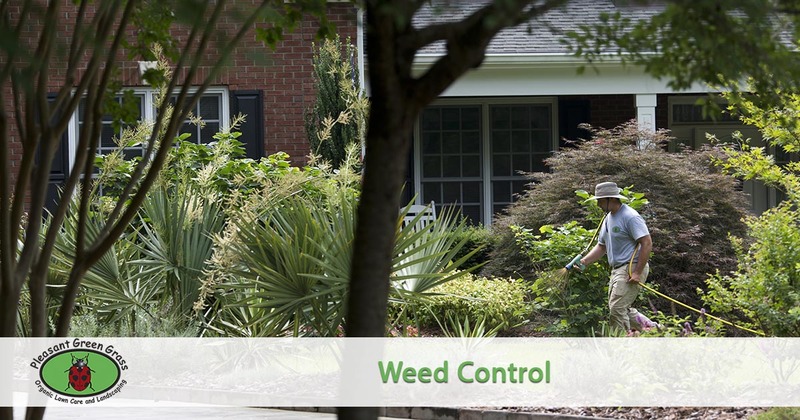 Weed control with the organic program is more of a process than a product. Weeds are indicators of poor growing conditions such as soil compaction, saturated soils, nutrient imbalances and improper cultural practices. Weeds are symptoms of poor health. As we work on correcting these conditions through organic lawn treatments, we can reduce weed growth. Ultimately, fertile soil and healthy turf is what will keep weeds at bay. We use two different products for our organic fertilization & weed control, that improve the soil and reduce weeds at once, GlutenGreen and One Earth Weed Control. GlutenGreen: GlutenGreen is an organic fertilizer derived from Corn Gluten Meal, Bone Meal, and Sulphate of Potash. Corn gluten meal, which is edible, is an EPA approved organic weed control. It’s presence in the soil stops seed from germinating properly. GlutenGreen produces a long lasting green up of turf grass with its 100% organic source of slow release nitrogen. The combined action of the fertilizer plus weed control will help stop new weeds from germinating while thicken up the turf. It’s the organic equivalent of a weed and feed. GlutenGreen results improve each year. The first year we can see up to a 60% success rate and up to 90% success rate if used over a three-year time period. GlutenGreen works best if applied in February, prior to the weed germination period. For improved results it can also be applied in the fall to help suppress fall germinating weeds. One Earth Weed Control: One Earth weed control is an organic product that is available exclusive to Pleasant Green Grass! We have rigorously tested and formulated this weed control to work in our North Carolina compacted clay soil. It is a more advanced compost tea application with added post emergent weed control that is not available anywhere else. It’s all natural and made from food grade ingredients. It works exceptionally well on broad leaf weeds and also helps to green up warm season grasses. Some weeds like henbit, purple deadnettle, fennel, shiny cudweed and Johnny jump up will die within a few days. Other, harder to control weeds such as wild strawberry, plantain, clover and dandelion may take a few applications. Clover is not always controlled immediately but will eventually fade out as the nutrients in the soil build up from repeated applications. Burn Out: Burnout is an all-natural, non-selective herbicide for broadleaf & grass weeds and a natural alternative to products like Roundup. Burnout is made locally from plant fatty acids and essential oils. It is 100% biodegradable, breaking down into inert ingredients once in the soil. Burnout removes the waxy protective coating from the surface of a plant. This exposes the plant to severe dehydration especially once evaporation pulls the remaining moisture out.This application works best quickest on hot sunny days when temperatures are above 80°F, but it will also work in cooler temps and even in the winter time. When it’s hot and sunny most plants will brown up within minutes of the application. Some plants living in full shade or plants with thick waxy-coated leaves may require a second application. Burnout affects the top growth of the plant. It does not get down into the root system. Some weeds with deeps roots may need multiple applications.Burn Out will help control almost anything in comes in contract with include common weeds such as chickweed, plantain, dandelion, pigweed, oxalis, mustard, foxtail, bindweed, and many more. Ready to experience the difference in your yard from working with an organic lawn care company? Give us a call at 919-357-8245 to get started or request a quote online.